The second program I’m reviewing today claims to have roots in the financial industry. Particularly in Forex trading. Can money still be made from Forex trading to guarantee regular withdrawals for investors? No clue. However, let’s find out more about a program called Btcpro.trade. The program joined Golden Stage on DavidNews.com monitor 7 days ago and has been online only two more days. I would call it a freshman, right? You need to know it’s a Bitcoin-only program. Now I have reinvested in it BTC 0.374 and on the 25th of January 2018, it’s still paying. Keep reading to find out more about Btcpro.trade and its features. Briefly about investment plans. There are 4 investment plans with daily interest rate starting from 5% and up to 10%. This is Bitcoin only program (but you can deposit with few other payment options as well) and minimum deposit in the first plan is 0.005 BTC while in the last it’s 10BTC. Of course, we are talking about different interest rates on the last one. Most important thing – after 24 hours of the deposit you can request it back. Anyhow, the investment plan “Bro” is the most affordable due to lower minimum deposit requirements, which still are comparably high – approximately $55.45 (please check the latest BTC rate). The minimum withdrawal is 0.0008BTC. All withdrawals are confirmed instantly but procedure takes time due to Bitcoin payment processing time. In the meanwhile, the program doesn’t have any withdrawal fee. Keep reading to find out more information case Btcpro.trade investment plans seems reasonable to you. 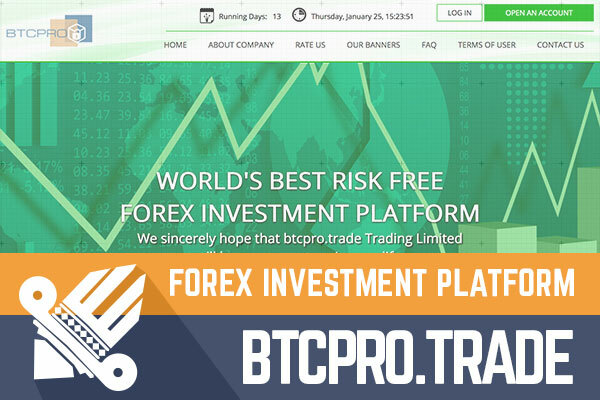 The website of Btcpro.trade HYIP is built using licensed Gold Coders script with a unique website design. I might be mistaken but I don’t recall a program been on our monitor with a similar design. Multi-Domain SSL certificate assigned by COMODO is valid until July 2018. The website itself is not anyhow special in terms of design or layout. On the homepage, you can find a fragment from their overall legend – “World’s best risk-free forex investment platform”. Of course, I doubt it’s really risk-free but I believe the main essence of marketing is to exaggerate, right… Hold on, the closing sentence – “We sincerely hope that btcpro.trade [..] will become a partner in your life”. Information about investment plans is also displayed on the first page but it lacks an investment calculator. Btcpro.trade has a good potential of attracting affiliate partners eager to earn commission fees due to its generous affiliate rate of 12%. All major information for a potential investor is provided on the FAQ page. The list of Q & A’s is not very large but it covers main questions there though. In case after reading this review and checking the website you still have any doubts or uncertainties feel free to contact the administration of this HYIP using the contact form or email address. The program doesn’t have any social media profiles or Telegram group. In fact, this program seems to be a very low profile. I understand it’s only two weeks old program but I couldn’t find any conversations about it on major HYIP community forums. Moreover, no information is available about it on Google. According to Alexa Traffic Rank, it has mainly visitors from Bangladesh. Probably, it’s the place where admin comes from… Who knows. Sure, Alexa needs more time to gather data. However, this program is very discrete and I couldn’t find any additional information about it. Let’s see if it will survive long enough to provide more data for Alexa Traffic Rank. The tricky part of the investment plans is deposit – deposit back after 24 hours. Even the FAQ page doesn't provide a clear answer. On one hand – the answer to the question“How long does my deposit work?” states that “Your deposit runs forever. This means that you will never get it back”, but on the other – “Can I get my deposit back? “Yes after 24hour of investment”. It’s not clear. Therefore, I checked and it is possible to release deposit anytime after 24 hours you want. I already wrote that the highest potential for attracting deposits has the plan called “Bro” due to its minimum deposit requirements of 0.005 BTC, which still seems quite high if compared to $10 minimum requirements. 0.02 BTC investment in this plan would require 20 days to reach the break-even point and another 20 to make the net profit same as the deposited amount. We are talking here about 40 days in total. The good thing is that accruals are calculated on all weekdays. We are looking at comparably young HYIP, which needs more time to attract more customers. On the other hand, why it hasn’t attracted yet more deposits with such generous mid-term interest rates. I believe that 40-day term seems attractive to anyone willing to make a 100% net profit. As I mentioned earlier, it’s low profile and very discrete. Remember, all HYIP’s are high risk. Therefore, if you ever decide to make any investments in this or any other program, don’t invest more than you can afford to lose! All we know about it is that we know almost nothing. In case you have made the investment and have anything worth sharing. Drop a message in the chat box! Investment plans: 0.21% up to 0.42% hourly (5% up to 10% daily) for unlimited term. Possibility to get the initial deposit back after 24 hours.